The CD14 antigen is a glycosyl-phosphatidylinositol-linked single-chain surface membrane glycoprotein with a molecular weight of 53-55 kDa. It functions as a high affinity receptor for the complex of LipoPolySaccharide (LPS) and the LPS-Binding Protein (LBP). It is found on cells of myelomonocytic lineage. 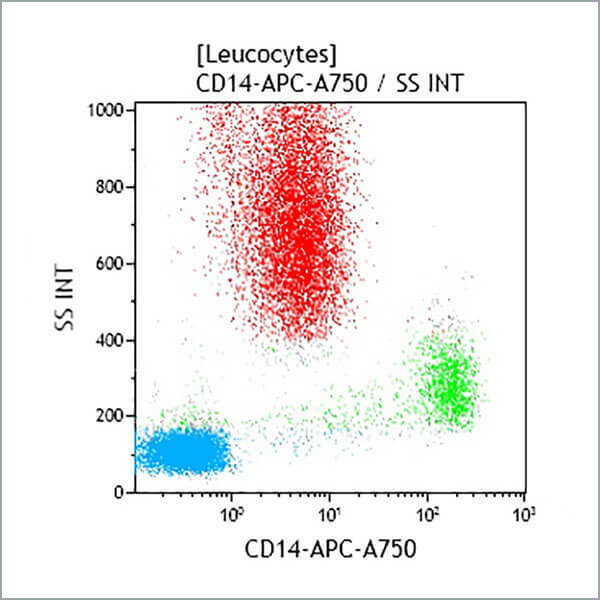 CD14 antigen is strongly expressed on monocytes, macrophages, and weakly on neutrophils. It is also weakly expressed on B lymphocytes, but is absent from T lymphocytes, NK cells, red blood cells and platelets. It is found on Langerhans cells, follicular dendritic cells and histiocytes. *Alexa Fluor and Pacific Blue are registered trademarks of Molecular Probes, Inc.